For the third time in four years [2016 and 2014], we are spending a weekend in February at Sea Ranch with the Sanborns. This also marks the fifth time in seven years [2013 and 2011] that we have spent a weekend at Sea Ranch in January or February. The Sanborns met us at our house about 8:15 am. We loaded their truck and were on the road before 8:45 am. I had made reservations for a wine tasting at Donum Estate at 10:30 am. Sharon's friend Noel had brought a bottle of Donum to dinner. I remembered him talking about the winery and thought it would be nice to explore a new place. We had a very intimate tasting. Afterwards, with it raining hard, they let us use the room to have lunch. Sharon had made New 0rleans style Muffulettas sandwiches for lunch. From there, we rolled towards Gualala. We picked up the key in town about 3:00 pm. We are spending three nights at Galleons Reach. After getting settled in, Sharon and I went for a walk. The rain actually stopped for a while. We walked to the point in front of Sea Ranch Lodge and back. In total, we covered about 2.9 miles. I had never walked out on the point in front of the lodge. I discovered two Sea Ranch historical markers (Kenkoku Maru grounding on Black Point Beach and Black Point Settlement/Bihler Landing) that I had never seen before. The four of us spent some time in the hot tub before dinner. Unfortunately, the hot tub stopped working and never worked again over the course of the weekend. It certainly was a wet winter this year and last! In fact we're still dealing with its aftermath with road repairs along the coast highway 1. But the weather does provide for some dramatic views- including this great photo of yours. Sorry its drama put a damper on your holiday and your stay had its added challenges. 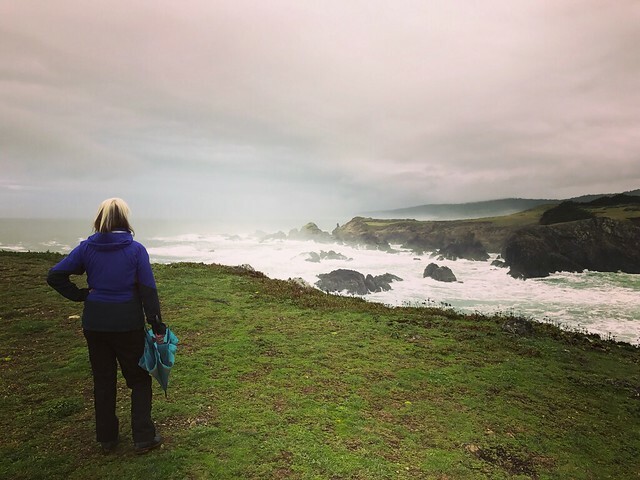 It can be a wonderful time to visit Sea Ranch, especially as it is the height of whale migration- presuming you can see in between the rain and sea froth. Will you be making another return to Sea Ranch? We love late fall and winters at Sea Ranch- such drama and it's also whale migration time! Best of all is the mushrooming along the forests and at nearby Salt Point. And the maddening crowd is not so, well maddening. Noticed also you've also done the Camino. That's on my husband's spring calendar this year! I Just shared that post with him.